A former Thailand Navy SEAL has died while working to save 12 boys and their coach from the submerged Tham Luang cave complex, the New York Times reports. The death comes as a heavy blow to the rescue mission, as monsoon rains threaten further flooding and as oxygen levels inside the chamber have started to drop. Image: The body of Saman Gunan is carried during a repatriation and religious rites ceremony at Chiang Rai Airport in Mae Sai, Chiang Rai province, in northern Thailand Friday, July 6, 2018. Around 1:00 am local time on Friday morning, Saman Gunan, a 38-year-old retired Thai navy SEAL, was on his way out of the cave system after delivering extra oxygen canisters along the route to the trapped boys and their coach when he ran out of oxygen and lost consciousness. His partner, who was unable to revive him, brought his body back to the mouth of the cave. Saman, who had left the Thai navy, returned to help with the rescue mission. In respect for his efforts, the Thai king said he’ll sponsor the funeral. It’s doubtful the boys will be told about the diver’s death, as the news would likely damage their morale even further, and at a time when they need to build both their physical and psychological health. 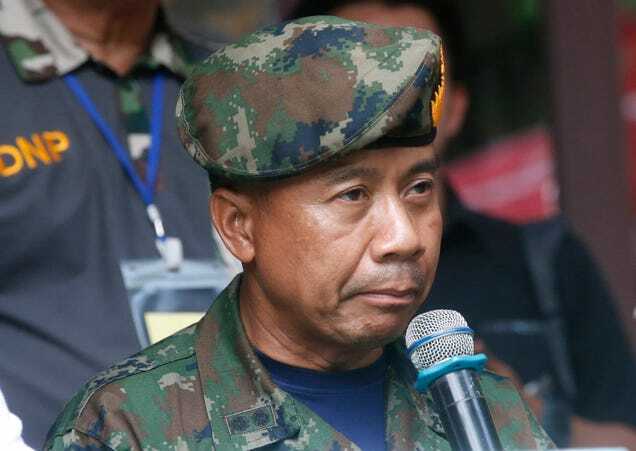 Thai SEALs commander Arpakorn Yookongkaew talks to reporters during a press conference held earlier today. The diver’s death underscores the danger of a rescue attempt. A round trip to the boys takes 11 hours, six of which, en route to the chamber, are against the current. Visibility is practically nil, and some passageways are mere crawlspaces. The 12 football players and their coach have been trapped in the Tham Luang cave complex for nearly two weeks. They were discovered by expert divers on July 2, about 2.5 miles (4 km) from the mouth of the cave. The “Wild Boars” team entered the cave when it was dry, but flood waters trapped them inside. Heavy monsoon rains are expected to resume on Sunday, presenting a challenge for rescue workers who are desperately trying to pump water out of the caves. Oxygen levels within the chamber are another concern. The demand for oxygen has increased owing to the presence of the support team members, who are currently attending to the boys. The oxygen level in the chamber is now at 15 per cent, down from the usual 21 per cent, the BBC reports. Oxygen canisters are being delivered to the chamber, along with food and medical supplies. Rescuers are currently working to connect a three-mile (5 km) cable to the chamber to supply oxygen, along with a fibre optic cable for communication. A plan to leave the boys in the caves until the monsoon season ends—which won’t happen for another four months—is appearing less feasible with each passing day and hour. A rescue attempt through the submerged passages seems inevitable. The expected rains will likely replenish the caves with water, but as the monsoon season progresses, there’s a heightened chance that sinkholes and streams will flood the cramped chamber. To complicate matters, the boys have never used scuba gear, and some don’t know how to swim. Sadly, the death of Saman Gunan shows how perilous the situation really is—even for experienced navy SEAL divers. Update 15:46 GMT: Four of the boys have now been rescued, in an operation that now spans 90 divers.